You’re in a frenzy getting ready in the morning, and then your eyeshadow slips through your fingers and lands hard on the floor, shattering to a gazillion pieces. Your heart stops and you cry “That’s LIMITED EDITION!” Sounds familiar? The Too Faced Lucky Charms Duo Eyeshadow charmed my socks off when I saw it. I needed some green in my eyeshadow collection so in the basket it went! The gorgeous lime, a unique color that shines like spring green meadows, really brightens up my eyes. Despite its rich pigmentation and crease-resistance, the Too Faced Eyeshadow Duo palettes come in a light plastic casing with a loose cover. The Lucky Charm duo eyeshadow is very soft – both soft in terms of texture and solidity. And I didn’t even drop it! I was just being less careful with it. *pouts* I have a habit of not being gentle with my makeup products. I tend to throw instead of put them into my makeup bag. But none of my eyeshadows have ever met with such a tragic death from my throwing! Even though this is not limited edition, I really like it and wanna keep at least the light green side. So, I decided to salvage it to the best of my abilities. If I’d known that broken powder makeup like eyeshadows and blushes were repairable, I’d never had to toss out those in the past. Here’s a step-by-step tutorial on how to fix your broken eyeshadow. Don’t throw your broken eyeshadows away because you can keep ‘em all with these simple steps! If yours is a mono eyeshadow, which is usually the case for people who fix their broken eyeshadows, this step would take like, 10 seconds. However because mine is a DUO eyeshadow and I’d brought it home from office, the 2 colors got kinda friendly together and mixed up. I had to use a stirrer and sieve out the light green color, leaving the remaining dark green color in the original pan. Otherwise, with a mono eyeshadow, simply pour the contents into a plastic bag. Start pounding the powder with the end of a brush, pen, nail polish bottle. Whatever that has a small and flat bottom. 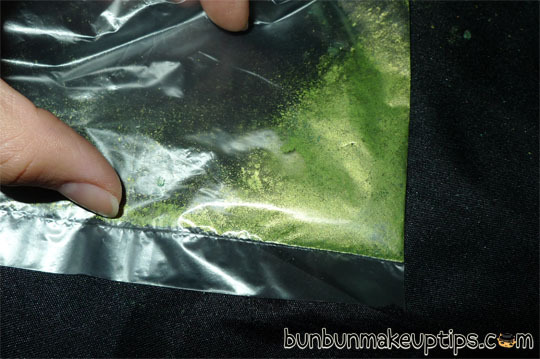 The purpose of this step is to ensure that all the powder is evenly crushed, which will make mixing a lot easier later. You may choose to sterilize the pan and jar with alcohol at the beginning but I prefer to sterilize them right before I pour the contents in. 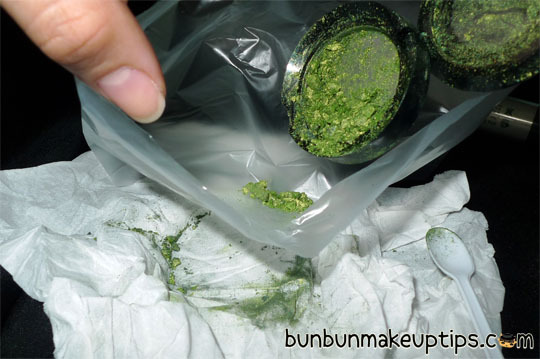 Pour the well-crushed eyeshadow into the sterilized empty jar. Squirt alcohol into the jar and start mixing it into a paste. The paste must look something like that, not too watery and not too hard. 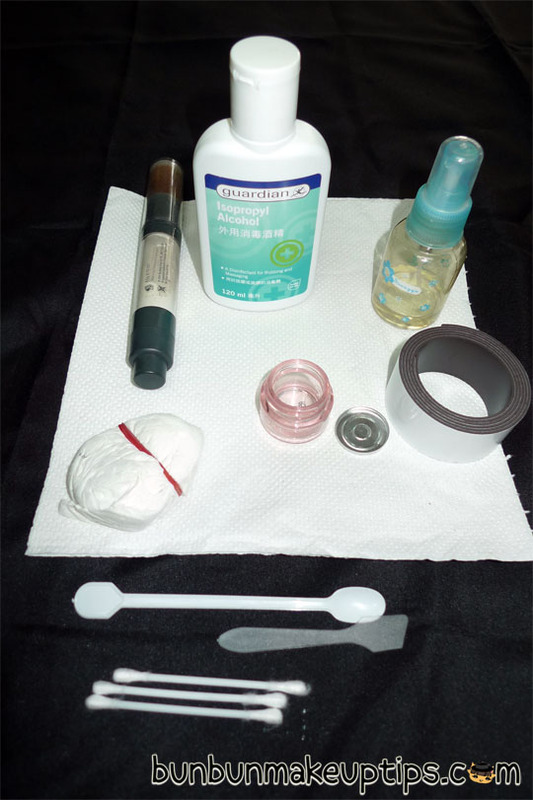 Using the spatula, scoop the pastey eyeshadow into the sterilized empty eyeshadow pan. Layer it on, bit by bit. You want to compress it as much as possible so that it stays solid. Lightly press the eyeshadow down after you are done transferring. Find a coin that fits the size of the empty pan. Here are some examples of coins that fit. Being the patriotic Singaporean that I am, I used the 50 cents coin. Haha! But it really did fit the best! 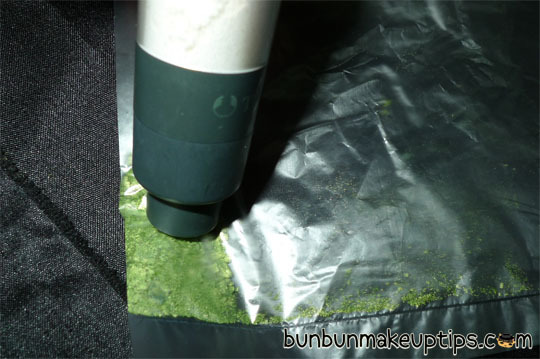 Let the eyeshadow dry for about an hour, then lay a kitchen towel over the eyeshadow and press hard to compress it. It is okie to stain the kitchen towel with the eyeshadow, unless you use 95% rubbing alcohol which will make the eyeshadow dry faster. Cut a piece of magnet and paste it at the bottom of the pan. You can put back fixed eyeshadows into their original casings (but I strongly don’t recommend that for the Too Faced DUO palettes), or place them in customizable makeup palettes like the Z-Palette. Which I really like! What do you do with broken eyeshadows? Share with us!